The Mitos P-Pump with 3-way Accessories is the Mitos P-Pump with 3-way Chamber Lid (Part No. 3200044) and Mitos P-Pump 3-way Vessel Holder Kit (Part No. 3200045). 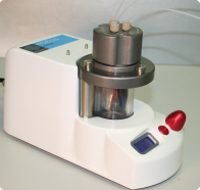 It can be used to pump 3 liquids simultaneously from separate micro tubes in the Mitos P-Pump. This provides a low cost method of delivering 3 reagents to a microfluidic system with pulseless pressure pump technology.